Scott Pruitt has already tried to neuter the EPA. Trump’s EPA pick has tried it before, and he’ll likely try it again. Only this time, he’ll be working from the inside. 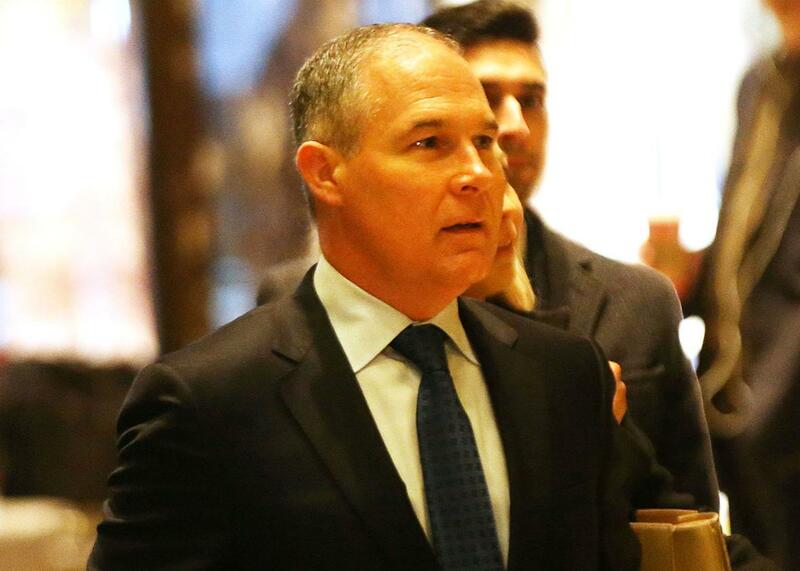 Scott Pruitt arrives at Trump Tower on Wednesday in New York City. When President-elect Donald Trump sat down for an in-depth interview with the New York Times last month, there was a brief moment when it seemed possible, though unlikely, that he might acknowledge climate change is real. When he nominated Oklahoma Attorney General Scott Pruitt to lead the U.S. Environmental Protection Agency on Thursday, those illusions flew out the window. Pruitt, like Trump, denies the scientific consensus about manmade climate change. Unlike Trump, however, Pruitt has been unwavering in that denial and, more troubling still, has experience trying to let these misconceptions inform our laws. The way he could do this is a bit technical. Despite Trump’s campaign promises, the incoming president won’t be able to unilaterally abolish the EPA, and rescinding the climate rules already in place would be an arduous process, thanks to lengthy public comment periods and other requirements that will allow environmental groups and their allies in state governments to try to preserve them. More importantly, though, the Clean Water Act and the Clean Air Act both mandate our right to, you guessed it, clean water and clean air. The EPA is essentially tasked with executing the actions necessary to ensure this. If Pruitt and Trump neuter the EPA, the federal government would still need to find another way to hold up the demands put forth by these two laws or face legal action. But when these fundamental environmental rules were put on the books—in the 1970s—global warming wasn’t on legislatures’ radars. And this is where Pruitt’s appointment gets scary. The only reason the Clean Air Act is able to regulate greenhouse gases is thanks to a 2009 endangerment finding, in which the EPA showed that carbon dioxide and other greenhouse gases pose a risk to human health. It was thanks to this finding that the agency was able to claim the authority and legal responsibility to regulate GHGs under the Clean Air Act. Without it, there would be no new fuel economy rules for cars and trucks, Clean Power Plan for the nation’s power plants, or any other number of rules and regulations designed to curb U.S. emissions. So, without the endangerment clause, the EPA wouldn’t even have the ability to regulate greenhouse gases. And consider this: If Pruitt had gotten his way four years ago, the EPA’s endangerment finding would be gone. In 2012, he joined with a dozen or so other conservative attorney generals to ask a federal court to strike it down. That challenge was rejected by the science-accepting D.C. Circuit Court of Appeals, but it’s hard to overstate just how much was at stake. Now that he’s about to put in charge, he’ll get the chance to take an even bigger swing, this time from inside the EPA itself. Fortunately, scrapping the endangerment finding would be a heavy lift even with Pruitt as EPA chief. While agencies are allowed to change their minds, they are required to offer a rational explanation for the reversal. As Harvard Law professor Jody Freeman has argued, that would be near-impossible for Pruitt when it comes to the endangerment finding, given that the courts were already won over once by the comprehensive scientific record that the finding was built on. Nonetheless, the president-elect’s team appears undeterred. A leaked memo authored by the head of Trump’s energy transition team promises the endangerment finding will be “reconsidered and possibly revoked.” The document was authored before Pruitt was officially tapped to lead the EPA, but there’s no reason to believe he thinks any differently than its author. Even if we assume Pruitt won’t succeed in revoking the endangerment finding, the fact the incoming Trump administration appears willing to even try is evidence of the dangers the next four years could hold. Trump, after all, has promised to withdraw the United States from the Paris climate agreement and to scrap the EPA’s Clean Power Plan (which is currently being challenged in court by, yep, one Scott Pruitt). Trump may not consider himself bound by the pledges he made on the campaign trail. His selection of Pruitt, however, suggests that his science-denying bluster on climate is at least one exception.